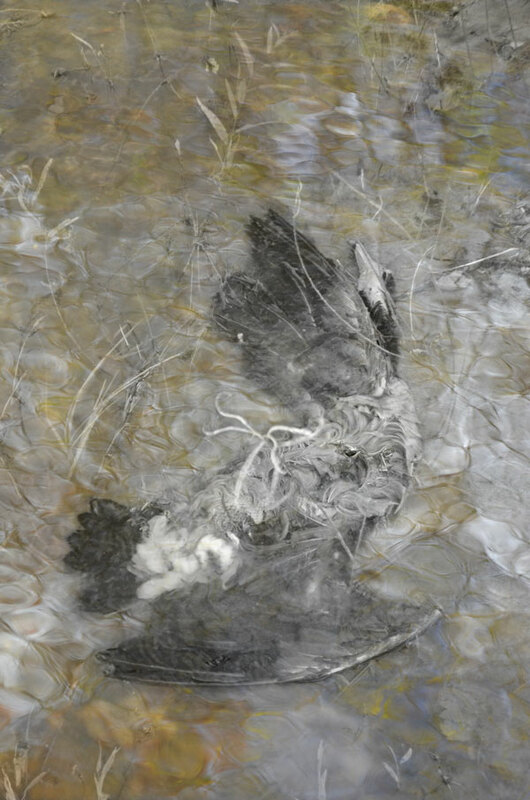 Reflections and remnants – another melding of two separate photographs. From the series Surface, Submerge. This is so painterly Karen. Just beautiful. The two images have melded completely. Hi Anna, thank you. I’m enjoying how this series is coming together, I’m happy you find it beautiful! Mortality is hard to face, even in nature but you have given this creature final beauty, resting and floating in a place it knows. Yes, I guess it’s an appropriate resting place. Thanks for your words. This is wonderful Karen. The texture of the water surface is quiet like the structure of well organized feathers. My brain tried to separate the two subjects, but didn’t succeed. I’m in love with the colours. Thanks very much, Anette. I tried taking out a touch of the colour but it wanted to stay. These images seemed to fit together nicely, I love it when things come together that way. I’s starting to think photography is fatal to our avian friends . . . Fiercely stunning. An awful beautiful image. That should be awfully-beautiful none the less. “Fiercely stunning”, now I love that! Thanks so much, Elena. This beautiful piece speaks to me of life and death. Bravo. Superb Karen. I wish I’d come up with fiercely stunning myself! Shoots the dead, and draws it back to life. organic photography I would say! I feel that this goose has just started a new life in a another world …yours! …Death disguised by landscape or the other way around. The sadness in this is beautiful. I like the soft ‘feel’ and subdued palette. They contribute greatly to an abstract image that perfectly matches the title. …and there’s a Chinese landscape/caligraphy feeling here, too. Beautiful. circulation of the world. There are beauty and mutability in this image….. The fact that the goose is trapped forever beneath the surface of your photograph really emphasises the sad, pathetic position of the body. Great double exposure. I just love this series Karen.. your voice is so destinctive..
Amazing how the ripples and reflection of the sky blend in with the body. I just love the composition. Is amazing and ispirational. Wonderful work!! Is so reflexive and touching!! Strangely beautiful. Sad, and if a work of art can evoke emotion, well, isn’t that why we do this? It is unreal how good this one is. Prints. Beautiful composition. Very effect blending of colour & texture.